LOS ANGELES, Nov. 27, 2018 /PRNewswire/ -- Smart & Final Stores, Inc. (NYSE: SFS), the neighborhood warehouse grocery store, today announced that its philanthropic arm, the Smart & Final Charitable Foundation, hit a fundraising milestone, raising $2 million for over 1,850 causes this year with the help of Smart & Final customers and store associates. This includes $96,000 recently fundraised and provided to the California communities suffering from the devastating effects of wildfires. Through the generosity of Smart & Final store associates themselves, $120,000 of that milestone was collected through the company's annual pledge drive, in which employees pledge to give a percentage of each paycheck to charity. Disaster Relief: The Charitable Foundation donated over $106,000 to disaster relief efforts, with the help of customer and store associate contributions. In response to the recent Butte and Woolsey fires, Smart & Final and the foundation have raised $96,000 through an in-store giving campaign and is continuing to donate food and supplies to first responders, evacuation centers, churches and animal shelters. Health and Wellness: Smart & Final store associates took part in 14 American Heart Association's Heart Walks, contributing and raising $56,500 in product and donations. Additionally, to support its partner City of Hope, Smart & Final stores raised and gifted a total of $313,000 through the Kids 4 Hope in-store giving campaign in October. 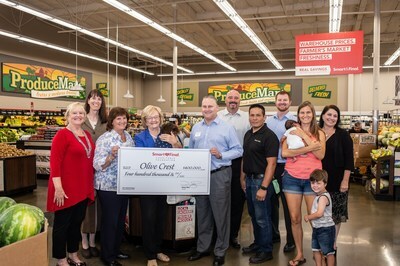 Youth Development: Store associates and the Charitable Foundation contributed $10,000 worth of gift cards and raised another $400,000 for Olive Crest, an organization committed to transforming the lives of at-risk children and their families. As a longtime supporter of Olive Crest, the Charitable Foundation continues to find ways to provide for their youth. In fact, one Olive Crest teen is now employed and beginning his career as a Smart & Final associate. Team Sports: In addition to the $100,000 the Charitable Foundation contributed to team sports this year, Smart & Final store associates also took it upon themselves to donate their time to numerous organizations, including Special Olympics, Little Leagues, and Boys & Girls Clubs. Hunger Relief: The Charitable Foundation continues the giving spirit this holiday season through its current sponsorship of PastaThon, an annual event raising monetary donations and pasta for Caterina's Club, which provides warm meals for youth homeless and low-income families throughout Southern California. Through December 7, shoppers at participating Smart & Final or Smart & Final Extra! stores can make a $10 donation at the register and Smart & Final will in turn provide pasta, pasta sauce, forks, bowls and napkins to Caterina's Club. Each $10 donation will provide 14 meals to kids in need. "From AYSOs, Little Leagues and school PTAs to charity walks and disaster relief, helping our local communities is at the heart of Smart & Final's culture," said Barbara Van Dine, Vice President, Smart & Final Charitable Foundation. "The dedication of our associates and customers to give so much of their time and financial assistance makes me proud to be part of this company and I am honored to assist through the great work of the Charitable Foundation." Established in 2002, the Smart & Final Charitable Foundation is a 501(c)(3) Charitable Organization which strives to give back, improve the quality of life and nourish communities we serve throughout California, Arizona and Nevada. Throughout the years, the foundation has donated millions of dollars to non-profits and organizations focused on health and wellness, education, hunger relief, team sports and youth development, and disaster relief. The Smart & Final Charitable Foundation raises funds through its corporate sponsor Smart & Final Stores, Inc., as well as through vendor donations, associates and in-store fundraising.